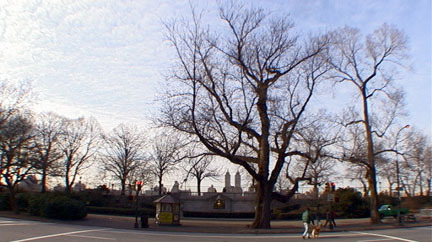 It separates east from west in Manhattan and from Central Park on the Upper East Side. Although it was created in the Commissioner's Plan of 1811 that established a rectilinear street grid for Manhattan's future expansion northwards on its small, narrow island, the city did not start acquiring its land until 1824 and then made acquisitions in non-consecutive parcels. For the next century or so, its development lurched forward tugged by the desire of the well-to-do to be a little removed from the hurly-burly commercial precincts that kept leap-frogging to the north stopping to pause for a decade or two at major cross-town thoroughfares such as 14th, 23rd, 34th, 42nd and 59th Streets. In the process, much of its former glory has been demolished. Sometimes the replacements were stupendously wondrous, such as the transformation by Rockefeller Center (see The City Review article) of a large stretch of brownstones of mixed character and virtue and the Beaux Art riches of the New York Public Library (see The City Review article) replaced the massive fortifications of the Distributing Reservoir between 40th and 42nd Street. 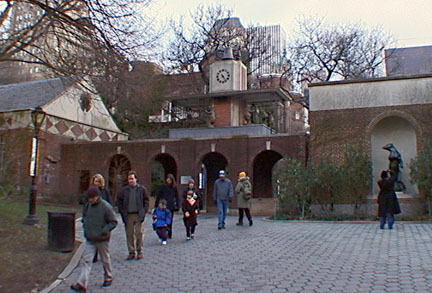 Sometimes, it was horrendously monstrous as the Pahlavi Foundation's replacement of the DePinna Store Building at 52nd Street or the 27-story very bland office tower designed by Carson & Lundin at 600 Fifth Avenue 48th Street that replaced the famous Collegiate Reformed Church of St. Nicholas in 1950 and was designated an individual landmark in 1985, apparently because it had been acquired by Rockefeller Center Properties since it certainly had no architectural or historical merit whatsoever, but then the city's preservationists in recent decades have not been known for consistency. One could argue very persuasively that Manhattan would have been a much better place if the redevelopment process had made a giant leap to 110th Street instead of destroying many of the good buildings between 42nd and 59th Streets and razing almost all of Millionaire's Row between 61st and 110th Streets. There are still some vestiges of the glory days of Millionaire's Row. 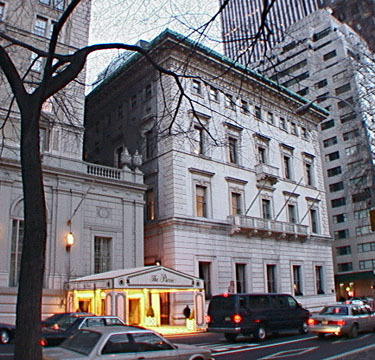 The Metropolitan Club, shown below, still exists (see The City Review article). Far more modest is the Knickerbocker Club, two blocks to the north at 62nd Street, which once had been complimented by an austere Georgian-style mansion behind a garden on the Fifth Avenue frontage just to the south and which was razed to make way for the less than magnificent apartment tower at 800 Fifth Avenue (see The City Review article). 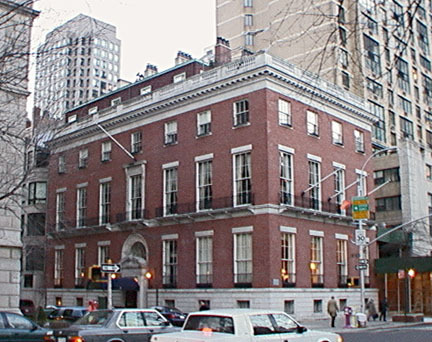 The Knickerbocker Club has long been known for its fine cuisine and exclusive and powerful membership rather than its interiors, which are pleasant but not awesome like those of the Metropolitan Club. 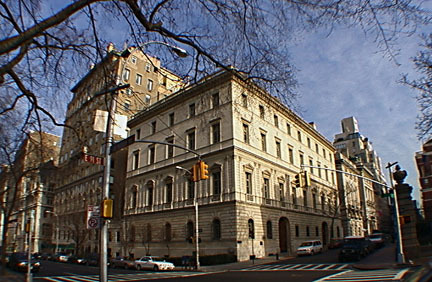 A far more attractive Georgian-style mansion is further north on the avenue at 94th Street, the former Willard Straight house, shown below, that ultimately was converted to the International Museum of Photography and then sold in 2000 to a private owner who planned to reconvert it to single-family occupancy. (See The City Review article). Another red-brick mansion albeit an interesting melange of different styles, is the former Benjamin Duke mansion, shown below, directly across the avenue from the main entrance to the Metropolitan Museum, as shown below. Like the Knickerbocker Club, it has also had one of the less distinguished "modern" apartment towers erected just to the south of it, 1001 Fifth Avenue (See The City Review article). Imagine, if you will, that the Penn Central had finished covering its tracks north of 97th Street and that a third major business district had been clustered about its major stop at 125th Street and that the northeast corner of Central Park had been built up to mirror the elegance of its southeast corner and that Central Park North had been redeveloped like Central Park South and that East Harlem had gotten all the high-rise apartments that replaced Fifth Avenue's great mansions. Well, history, of course, didn't take that path, unfortunately. Because of its central location and breadth and heritage of wealthy enclaves and dazzling emporiums and as the historic gateway to Central Park, Fifth Avenue became New York's best internationally known address, not just for residences, but for offices and retail as well. In the 1950's, of course, Park Avenue stole its thunder and clout for commercial addresses for several decades, and in the 1970's some Upper Fifth Avenue residents also opted for the quietude of Park Avenue as parades proliferated ad nauseum up Fifth Avenue. Although Grand Central Terminal (see The City Review article) broke Lower Manhattan's grip on the office market, midtown Fifth Avenue really did not emerge as a major office center until the emergence in the 1930's of Rockefeller Center as the Depression knocked the wind out of the development sails that one might have expected in the wake of the completion of the Empire State Building (see The City Review article) at the start of that decade. As a result, the midtown mansions came down and its residents moved north, pushing even beyond the great fortress-like Arsenal Building in the park at 64th Street, shown below (see The City Review article). With the Plaza (see The City Review article), the Savoy Plaza, the Sherry-Netherland (see The City Review article), which is shown at the left, the Pierre, the St. Regis (see The City Review article) and former Gotham Hotels in place at the start of the Depression, the northern section of the avenue in midtown had established itself as the city's supremely elegant enclave for hotels that satisfied tourists and travelers as well as the society matrons and debutantes and escorts who filled their ballrooms and reception facilities. The period after World War II has not been kind to Fifth Avenue although it took a decade or so before serious destruction began. Just contrast the wonderfully ornate hanging lanterns at the Sherry Netherland Hotel with the plain vanilla wrapper of its apartment building neighbor adjacent to it, shown at the right. 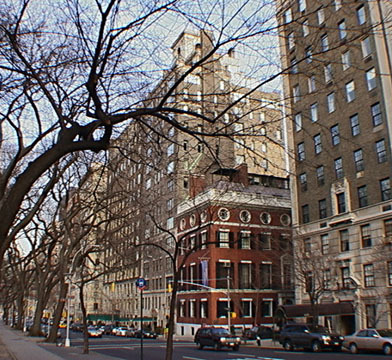 One of the few blocks that retains the flavor of the old Millionaire's Row is between 78th and 79th Streets, shown above. 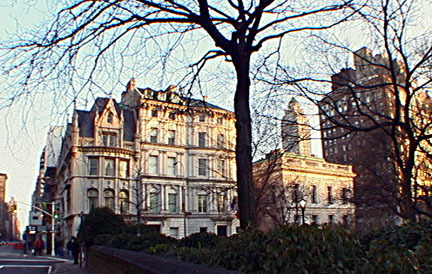 While some of the avenue's great houses have became important public cultural institutions, like The Frick Collection, part of whose garden is shown above, or the Solomon R. Guggenheim Museum, shown above, or the Jewish Museum, shown below most have vanished and been replaced with far less impressive and elegant structures, albeit with many more residents. Several others have been converted to schools such as the three elegant buildings on the southwest corner at 84th Street that now comprise the Marymount School. By the end of the 1960's, many fine, old retailers were leaving the avenue as banks, airlines, travel agencies and tourist traps were willing to pay substantially higher rents and the sophisticated charm of the avenue gave way to a more corporate and sleazier character. Gone also were the ornate traffic director stands in the middle of the street and the elegant double lamp street lighting. And, most importantly, gone are the open-top, double-decker buses that provided the greatest sightseeing experience in the world (although one or two made a comeback in the early 1990's run by private sightseeing companies). The city's great double-decker buses were eventually replaced by new, single-height buses that offered air-conditioning, but no skylights for enjoying the ride and whose black-tinted windows made viewing from the inside at night virtually impossible - the idiots who authorized these windows should be chained within the buses for a year! The double-deckers had to go because the city wanted to install traffic lights hanging over the street for the convenience of drivers from New Jersey. Those decision-makers, probably the same who gave us the incredibly ugly gooseneck street lamps, should be banished to New Jersey with no rights of return as well as having the gooseneck street lamps permanently implanted on their persons! 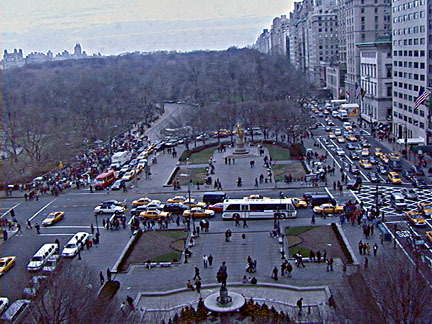 While on the subject of the city's bureaucrats destroying the city with virtually no public notice or press coverage at the time, the Bureau of Franchises and Licenses also happened to permit hordes of suburban commuter buses on Fifth and Madison Avenues, not only cluttering up and worsening traffic and air pollution but also forcing the city buses to make stops further apart just to make life wonderful for the suburbanites who abandoned the city for selfish and not civic purposes. Peddlers, of course, next to the very fine new F.A.O. Schwarz sidewalk clock at 58th Street, are a terrible blight and have made it hard for taxpaying retailers to justify paying rents that for decades have been among the highest in the world. The city planners tried to address some of the avenue's problems by enacting, on March 26, 1971, the Special Fifth Avenue District from 38th to 58th Streets extending 200 feet to the east and west into the mid-blocks off the avenue. The new regulations banned new plazas and off-street parking facilities, restricted signs to not more than one-third of retail windows, permitted residential uses on higher floors to encourage mixed uses to enliven the area at night, and limited retail use by banks and travel bureaus to not more than 15 percent of the linear street frontage of the zoning lot on or within 50 feet of the avenue and no more than 10 percent of the total lot area of the zoning lot within 50 feet of the avenue. One of the few really good new buildings to be erected on the avenue was 461 Fifth Avenue (see The City Review article) at 40th Street, designed by Raul de Armas of Skidmore, Owings & Merrill in 1988. Five years later, another handsome structure went up with a very elegant stainless steel and glass base on the northeast corner at 46th Street. Two major mixed-use buildings were developed on the avenue: Olympic Tower (see The City Review article) looming over St. Patrick's Roman Catholic Cathedral (see The City Review article) at 51st Street and Trump Tower (see The City Review article), which replaced the wonderful Art Deco former A. T. Stewart Building that had housed Bonwit Teller for many years, a far better building than Tiffany's. Despite its dark bronze glass and brassiness, Trump Tower, designed by Der Scutt of Swanke Hayden Connell, is a superb project that catapulted its developer, Donald Trump, into his own hyperbolic legend. But some bad buildings also went up such as the atrocious 34-story, sliver tower, designed by Kahn & Jacobs in 1970, at 489 Fifth Avenue overlooking the New York Public Library wedged in between the sedate 1916 Rogers Peet Building at 485, designed by Townsend, Steinle & Haskel, and the handsome 1917 office building at 501 Fifth Avenue, designed for Albert E. Thorne, George L. Nichols and Albert G. Milbank by Montague Flagg, all shown at the right. The boldness of the horizontal banding is impressive, but given the context this design for developer Jesse J. Secoles is abominable. John Carl Warnecke's frightfully unimaginative 35-story building for a foundation controlled by the Shah of Iran at 650 Fifth Avenue at 52nd Street in 1979 and Emery Roth & Sons' disappointing 40-story tower at 575 Fifth Avenue at 47th Street for Sterling Equities in 1985 are not quite as bad, but certainly do not embellish the avenue. The city's ailing central artery got a major infusion of healthy and quality redevelopment in the late 1980's when Solomon Equities and the Taubman Company erected a new 53-story tower incorporating a relocated Bendel's at 712 Fifth Avenue (see The City Review article) at 56th Street and when Bergdorf Goodman expanded its commitment to the avenue by opening a large men's store across the street from its famous store at 58th Street. The closing of B. Altman's at 34th Street, however, in the 1980's indicated that big department stores still face a very uncertain future. Fortunately, Peter Malkin, Earl Kazis and Mort Olshan have assiduously worked to preserve and convert the handsome building to other uses. In its architectural sum, Fifth Avenue is still pretty impressive with such masterpieces as The Empire State and Fred F. French buildings, the New York Public Library, Rockefeller Center, St. Patrick's Cathedral, the University Club (see The City Review article), the Metropolitan Club (see The City Review article), Cartier's, Saks Fifth Avenue (see The City Review article) and Bergdorf Goodman and the Sherry-Netherland and Plaza hotels. But Fifth Avenue is not really about architecture as much as its parades of people, boulevardiers and fashions. The 57th Street intersection is the center of the world and has been for half a century. The agreement in the late 1980's of the owners of the four corner buildings to hang the great electric light snowflake during the winter holidays almost makes up for the suburban buses and Rockefeller Center's Christmas Tree never fails to memorably impress. Window-shopping was saved by Gucci's leading the foreign invasion of New York in the early 1970's. Although Harry Winston apparently never got the message of Tiffany's great designer, Gene Moore, that creative window displays enhance all values, particularly civic, at least Winston has stayed on the avenue as other retailers even more gaudy - Fortunoff - or ersatz - Bulgari - have opened up new stores. There are few development sites left on the avenue in midtown. A couple of buildings will continue to get new facades from time to time and reflective glass is still cheaper than richly carved marble or limestone, unfortunately. Fifth Avenue's most elegant stretch from 49th to 61st Streets remains very imposing, lively and the best the city has to offer. The southern stretch from 32nd to 48th Street never was quite as elegant and over the years has lost a lot of its important retail stores such as B. Altman's, Gorham's, Sloan's, Woolworth and Kress. Meanwhile, other, much newer midtown areas with decidedly different personalities and more pizzazz have emerged such as the new Times Square and the new office precincts along the Avenue of the Americas and Madison, Lexington and Third Avenues. What Fifth Avenue in the 30's and 40's needs is an infusion of youth-oriented retail and restaurants such as has transformed much of the Flatiron Districts and NoHo, but whether the markets are vibrant enough to accommodate such an expansion and pay midtown rents is not clear. There are still a few blocks left on the avenue that consist of small-lot properties and some of this have retained their charm although the incursion by the Philippine Building, the large mostly blank wall shown at the left, was not a high-water mark of inspired design even if the avenue is the proper place for national showcases. Other blocks have kept a good cluster of older buildings although their integrity has been marred by ambitious retailers. Sometimes, the eye-level retail remake has justified the aesthetic breach because of the importance of the retailer, such as Gucci, or the plain old flamboyance of the store design such as Fortunoff's, shown below, whose four-story high angled, chromy facade at least in the block's tallest building. Artists, such as Childe Hassam and George Luks, had love affairs with Fifth Avenue's banners and they should be encouraged even more. 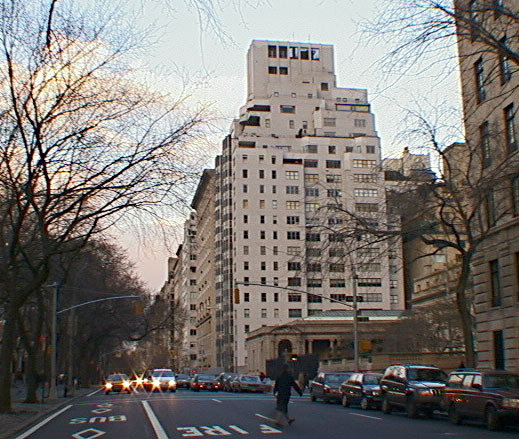 The Fifth Avenue Association, a non-profit organization composed by major owners and tenants in the area, has been active for many years, but its architectural awards began to lose their significance a number of years ago and it has not been as active as it should although it occasionally would complain about peddlers, a genuinely terrible situation that the city has been far too lax about for two decades. A more positive trend is the creation in the 1980's of business improvement districts in which property owners pay for special services such as sanitation and security and urban design improvements. Grand Central and Times Square have strong such districts, but Fifth Avenue is lagging. It shows when people care. In the meantime, get rid of the suburban buses, replace the traffic lights and street lamps, bring back or recreate the mercury statues and get new open and closed double-decker buses with untinted windows and enjoy! As great as the city's and the avenue's problems are, individual enterprises can make a surprising difference. Many poor parents quite naturally may want to avoid taking their children into F. A. O. Schwarz, but the toy store happily created an amusing sidewalk clock that enlivens the street and refreshes an old tradition. And the 1993 Warner Bros. Studio Store at 57th Street (see The City Review article) may have been the best thing to have happened on the avenue in decades with its amusing bas reliefs and huge window posters of its ornery cartoon heroes posing in caricatures of some of the world's most famous paintings. A subsequent expansion of the store, however, significantly altered the handsome building's facade and not for the better. Nevertheless, hopefully, poor parents will take their children inside for in the midst of the mountains of silly merchandise are zany installations that are up to the level of Red Grooms, the artist, which is to say, fantastic. The store makes you want to smile whatever the weather and that's all, folks! See lengthy article with illustrations in The City Review of Jerry E. Patterson's book, "Fifth Avenue, The Best Address"